Gleason’s Gym has been a real lifeline for me of late. The surety of going through my paces so to speak, the shadow boxing, pad work, heavy bag, double-ended bag, speed bag, abdominals, stretching and combinations thereof are a balm. Even the early mornings offer solace. Up a 5:30 AM, off to the gym by 6:30 AM, in the ring by 7:00 AM out by 8:00 AM, showering and dressing, and off to the subway by 8:20 AM or so—two to three mornings a week. Then the long Saturday morning, where I can tarry and work extra rounds, and feel embraced by the easy camaraderie of people who push themselves to their physical limits. What I also know is that I am a little sad and a little scared and a lot angered by a myriad of issues that are whirling around me. Unpacking them is complicated by a reticence to really face up to the deeper veins of truths that I would rather not face suffice to say they always come out anyway so sooner or later the reckoning will happen. And yet there are other emotions. With puff pillows for hands one cannot “do” for oneself in any meaningful way. Sure, one learns to hold on to a water bottle between two gloved hands, but one cannot drink from it unless someone has unscrewed the cap. One also finds oneself being ministered to in such intimate ways. A trainer will towel off the sweat from ones face, apply vaseline, adjust ones clothing, tie a boot, wipe one’s nose. There’s a real “giving over” to allow all of that—a trust that one puts on to others. For me the act of putting on the gloves swirls in the duality of empowering myself and giving myself over. At once I seek a kind of perfection of movement and strength, while also allowing myself those helpless feelings: That sense that I cannot always take care of everything whether that means throwing a perfectly executed one-two combination or asking my trainer to dab the sweat out of my eyes. It’s also how I know that I cannot magically and in any immediate way change the political nightmare I feel we are living through—except that I know that my voice can count among the many and on that basis push through, just as rising three mornings a week in the predawn light and heading to the gym is a sort of metaphor for becoming something better and stronger. Yes. I’m in the midst of a stew—as many of us are on any given day in the cycle of life, but waking up and feeling the power of the leather hitting a heavy bag goes a long, long way towards making it all a who lot better. Having gone back to the gym for a fairly serious heart-pounding workout three-days-a-week, I can attest to the benefits of the experience–not the least of which is the sensation of being fit. Carving out the time for it–and then sticking to it is something else. Aside from negotiating when to go (before or after work) there’s the bit about squaring things with loved ones for the two plus hours, times whatever number of days a week you intend to go. With that taken care of, it’s just a matter of actually showing up! Having offered every excuse there is to give–it’s raining, too hot, too cold, I’m tired/hungry/had a bad day/had a good day–the starting premise for success is to go even if my arm is in a sling! I guess the point of it is having made the commitment to the gym, why cheat at solitaire so to speak. This time is for me and even when I’m tired and grumpy and not feeling 100%, by the time I’m half way through my workout, all of the excuses I was formulating in my mind *not* to go have long since disappeared from my consciousness. By that point my muscles are warmed up, my body limber, sweat dripping in sheets of water, my face flushed from exertion; whatever resistance I may have had replaced by the minutia of slipping a straight right. Gym time is also about making the experience a good one. After all–it is you who are making the commitment to come and workout. In my case it has meant making certain that the trainer I work with shares my objectives and listens to what my needs are. 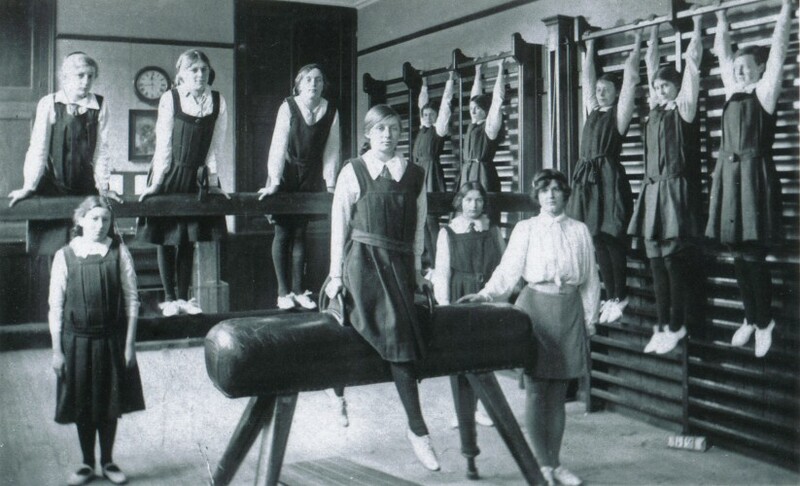 That wasn’t always the case for me–and it took a while to understand how to assert myself in the gym. 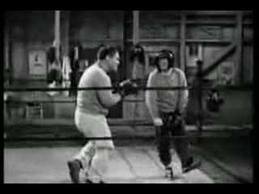 It’s also fundamental to the old boxing adage “protect yourself at all times”! If I can make a suggestion to anyone coming back to regular workouts, ensuring that you are comfortable with your trainer or instructor is a very important part of the experience. Furthermore, just because you haven’t been in the gym for awhile or you are a novice at particular skills or breathless after a couple of rounds doesn’t mean that you are at the mercy of a trainer who doesn’t have your best interests at heart. In boxing this can mean being pushed to spar before you’re ready with a risk of serious injury–a totally unacceptable outcome. It can even come down to the choice of a gym or the type of activity you chose to do during your gym time. The main point is to be honest with yourself about what you hope to achieve, how much time you have to devote to it, your willingness to commit to it and you willingness to “try on” a few trainers to find the right one for you. With all of those pieces in place, the experience should be nothing less than fabulous–making each and every time you hit the gym a special treat: one that you deserve for putting so much of yourself out there in the first place! Stepping back into anything whether its training or writing blog entries takes a bit of getting used to! 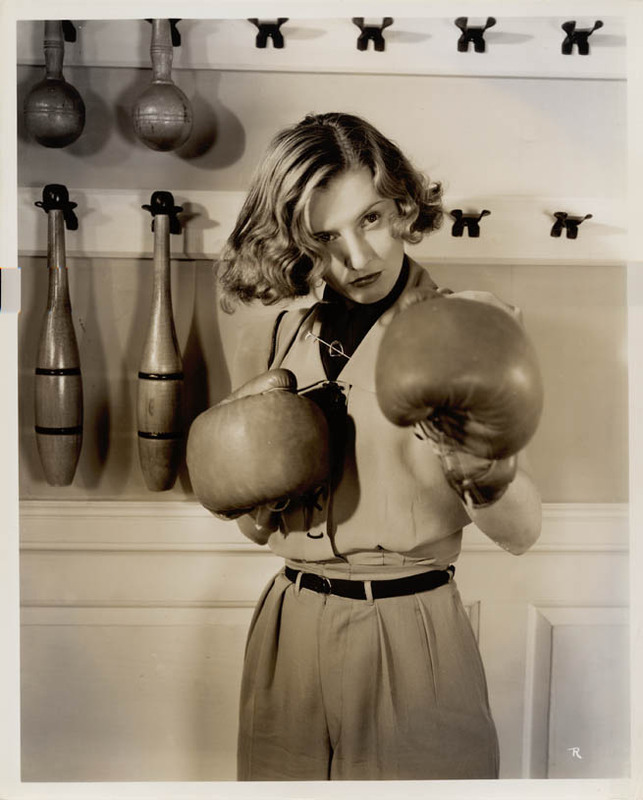 With my manuscript for A History of Women’s Boxing at the publisher (and working through manuscript cuts)–I can attest to how difficult it is to find one’s way back to the earlier routines. Boxing–not unlike serious dance–is a sport that requires constant fine tuning not only to keep one’s muscle-memory in tact, but to make physical sense of all of the nuances. Throw in some old bones like mine and that savvy seems to revert back to near on zero after a few months! For the last four weeks I’ve been attempting to turn back the clock–so to speak–to move my body into the next “space” vis-a-vis how I look to myself shadow boxing in front of the mirror. In a word … Ugh! Well, okay, I’ll modify that. “Ugh!” for the first three weeks and a mere, sheesssshhhh for today. With just a four-month layoff, my timing became non-existent, I couldn’t muster more than 50 situps and the pad work was ugly. Facing my trainer Lennox Blackmoore in the ring was even worse! I could *barely* make it through three rounds (never mind four) of the *ugliest* looking punching you’ve ever seen! And there was not ONE straight right that I didn’t walk in to! Talk about humbling. By the second week–I could at least make it through three + rounds, but my ring performance was no better even with Len egging me and shouting SLIP! I think I managed to slip exactly one punch–well, maybe I’m being a bit generous to myself. I also managing a 16 round workout, but the situps remained pathetic. My next step was to add two nights of training on my own after work–to at least bring my conditioning up and to focus on basics such as stance and the jab-jab-right-slip-right combinations. Last Saturday, however, was even worse in the ring–I still kept heading into the straight right, and finally in frustration, I just had Len keep throwing rights at me till I’d slip left out of the way! That seemed to help somewhat although I was still feeling bummed and even my timing on the double-ended bag was awful. Back at it this week I kept plugging away doing rounds on the slip-rope and the heavy bag to work on those imaginary punches coming my way and spending rounds working on my stance, my footwork and throwing punches from the “slip” position. The only bright spot was realizing that my conditioning was coming back–with my body comfortably moving and working hard through all 16 rounds of work. That all paid off today when I was able to get through four rounds in the ring with Lennox still able to breathe! As for slipping those punches–we’re talking a work in progress! He nailed me CONSTANTLY, but I did manage a few in every round and kept up with him when we shoe-shined during the last 30 seconds of the fourth round. As for the rest of my workout, I had lots of stamina and spent a good six rounds slipping and punching as I moved around the heavy bag and the double-ended bag. The speed bag work was fun too. I was doubling-up like a demon and jumped over to the double-ended bag during the one-minute round breaks. And beyond that I actually did 100 situps–admittedly slooowwww, but at least back to my old number! Despite the fact that my conditioning is much improved, I still feel like a physical moron in the ring and realize that it’s a matter of retraining my brain. The fact is, when I see a punch coming, I want to pull back, and that would make sense if I was stepping back with it and following it up with something, but I’m not. I’m just dumbfounded as I try to hit back and as the milliseconds of inaction tick by I, of course, get slammed with another punch! The “Pollyanna” in me is convinced that my 59-year-old body can learn some new tricks … but even if I never really do, I at least feel good for trying. Here’s a nice short video on how to slip a punch–and if you don’t have a slip bag, you can always follow my lead and slip the shower head in the morning. I’m off to Gleason’s Gym today for the first time in a while. PT has been helpful in bringing back a good portion of my range of motion and strength, but I’m about to put all of it to the test when I work the speed bag for the first time. Since I’m still only at about 165 degrees (should be well past 180), it’ll be an interesting challenge to say the least. More than anything, I’m looking forward to seeing my trainer, Lennox Blackmore, who is himself coming back from knee replacement surgery! Talk about the “blind leading the blind,” but given my state of things slugging s-l-o-w-l-y will be just about my speed. Coming back from any injury is never easy. If I can use mine as a case in point, I will note first off that as savvy as I thought I was about what the surgery and recovery entailed, I truly underestimated how much it would affect my life and how long the process would take. Setbacks also happen–thankfully not in all cases, but in when they do, as in mine when my shoulder “froze” it may mean adding months to the recovery process. Losing the use of one’s dominant arm or other part of the body that is intrinsic to normal functioning for several weeks also takes its toll physically as well as psychologically. If one has been very active, the sight of one’s clipped wing or damaged leg is no fun and no matter how many pep talks one gives oneself, there are those moments. Mine came when my physical therapist demonstrated an exercise on my body that I literally could not do without his help. It was about 12 weeks into the process and there was something so visceral about not being able to do a movement that had seemed so simple that it released the flood gates of pent-up feelings about the experience. Those cathartic moments are likely a component of any recovery process and if they happen, there’s nothing wrong with giving into it until one can shake it off to go back at it the next time. In my case, I was able to do the movement on my own at the next appointment – and I will say it remains my proudest moment in PT. Unfortunately, we don’t have Dr. Crusher to wave a magic wand on our limbs to heal our ills. The fact is as great as orthopedic medicine has become the aftermath to surgery entails a bit of a slog to get back to full physical health. As experiences go, however, it is certainly far from the worst that life has to “offer,” and each bit of progress brings one that much closer to the goal of regained strength and mobility–all it takes is perseverance, consistency and patience! I am at Gleason’s Gym. The sounds and sights the same. The bop-bop, bop-bop-bop of the heavy bag and trainer’s mitts. The words of encouragement and plaintiff yells shouted into the ring. I miss this world a lot. The sweat and feeling the power of my body torquing towards a finite point beyond as I smash into something. 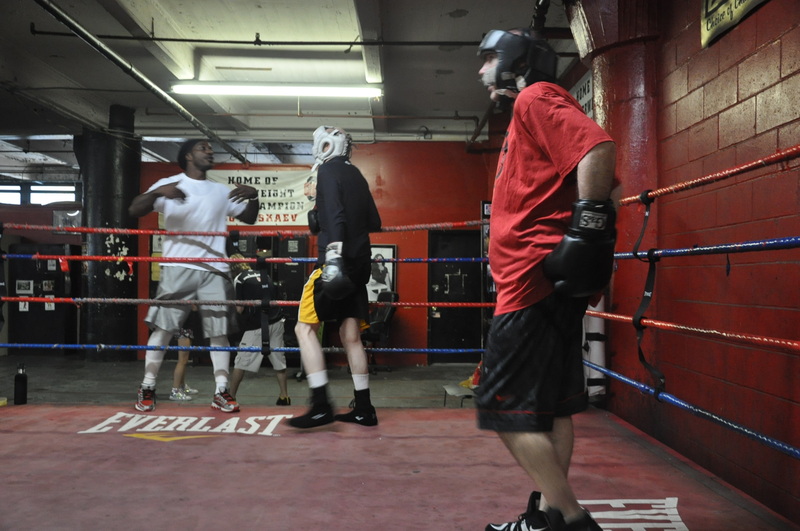 In the ring with Len, pushing off when we’re in close, the brava feeling of popping him right down Broadway on the nose. I like the close combat; hate the feeling of being overwhelmed and not knowing what to do when I’m swarmed and getting banged on and am aching for the bell so that I can collect myself again. Ring clocks and rest periods and those three-minute intervals for pushing at the limits of endurance: I love the discipline of it. The finiteness. The I-can-do-this challenge of throwing punches fast and furious with no let up even as my muscles begin to ache and start in on begging as if to say—if you let me stop I promise you relief and easy breathes and lots of time to sit around doing nothing eating chocolate. But it’s not how it goes. I keep at it, digging in deep, screaming out “are you kidding me?” as the punches continue to flurry, to hit hard, my hips turning with each straight right and uppercut, yelling out “sorry” when the throw isn’t true, when I’m more pitty-pat than fiercesome warrioress mindless of my 58 years on the planet or achy breathlessness. Ding. Time to breathe. To gulp down a sip of water. To let Len dab at my brow with my towel, to take the sweat out of my eyes, to hear him say, “that’s good girl, very good,” the only accolades I really live for. The acknowledgement of my work, my effort, my push through the rebellion that is my body urging me to ease up on a nice comfy couch with nothing but endless British police procedurals to watch for hours at a time. One armed and restless, my right shoulder in a bit of an ache as I listen to the sound of the heavy bags straining against the weight of so many boxers pounding them, I can think of nothing greater than getting the all clear from my surgeon to return. Six months from now, a year from now, I’ll wander in with a smile that cuts through me to take my place again at the mirror. My body out of boxing shape, needing to take it slow and easy, I’ll find my way—starting at the beginning with my stance, my jab and the first few tentative throws of my right arm. It’ll be back to basics then. An old dog relearning tricks I used to take for granted; protective for sure of my shoulder and of harming it again, I figure it’ll give me the chance to box that much better, to seek out a sort of perfection in the mechanics the way pitchers find theirs after injury. And that is what it is about anyway. Second chances. Ways of making things better after you’ve been down for a while. Leastways that’s how I see it. 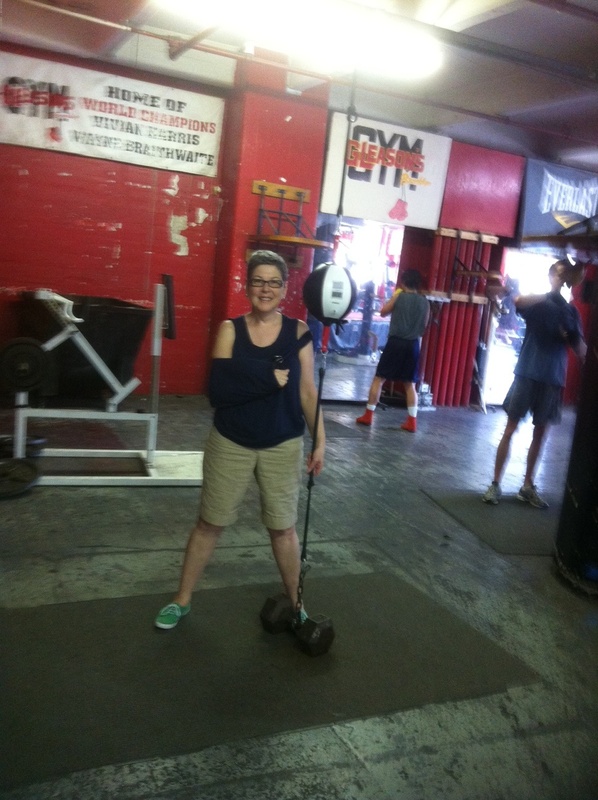 I have a rebuilt shoulder so that I can rebuild my boxing—smarter, tauter, tougher and ultimately easier. That is what life is about. Working through the hard stuff to find a simpler way around as one peels back through the layers of interference. In my case a lot of junk and lots of tears mucking up the movement of my shoulder, but clearly more about the business of life where we all tend to lose site of things till we’re cloudy and full of obstructions that make movement nearly impossible. Thanks to my very great surgeon, I’ll have full use of my shoulder again, an assist I appreciate and will take full advantage of once I’m healed enough to move forward. As with most things, we need a helping hand from those around us. What I appreciate so much is that I’ve had more than my share leaving me blessed in ways I truly cannot yet fathom, but feel so humbly grateful for. 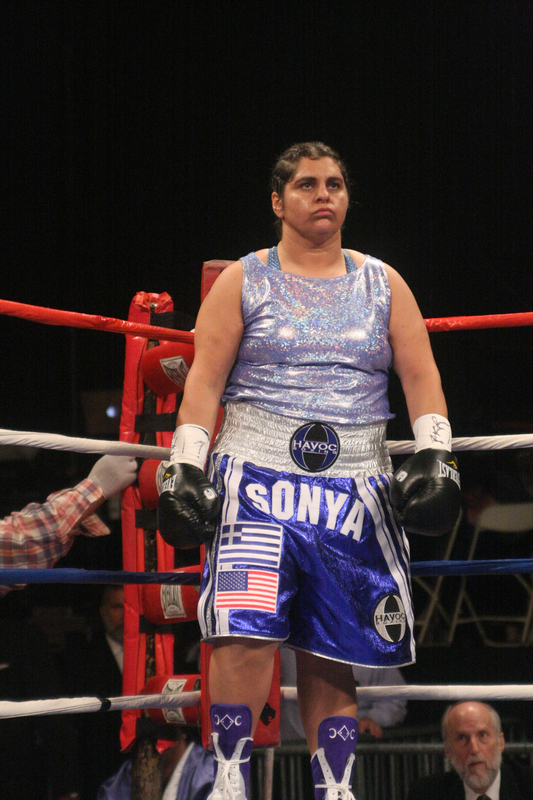 Exclusive Interview with Sonya Lamonakis set to fight on June 14th @ Roseland Ballroom! 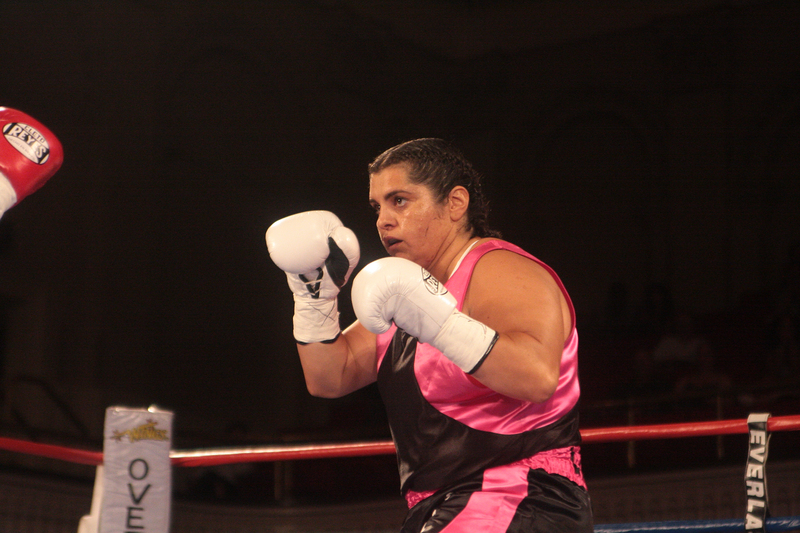 Gleason’s Gym’s own scholar and favorite female heavyweight Sonya Lamonakis (6-0-1) will be returning to Dibella Entertainment’s Broadway Boxing in a rousing six-round rematch against Tiffany Woodard (4-6-2) on June 14, 2012 at the storied Roseland Ballroom. Lamonakis and Woodard have met twice before. While Lamonakis has won both fights, their last outing also under the Broadway Boxing banner at Mechanic’s Hall in Worcester, Massachusetts in August 2011 resulted in a split decision win. While Lamonakis has been hard at work prepping for this bout, she’s also been finishing up the school year at the Family Academy school in Harlem. 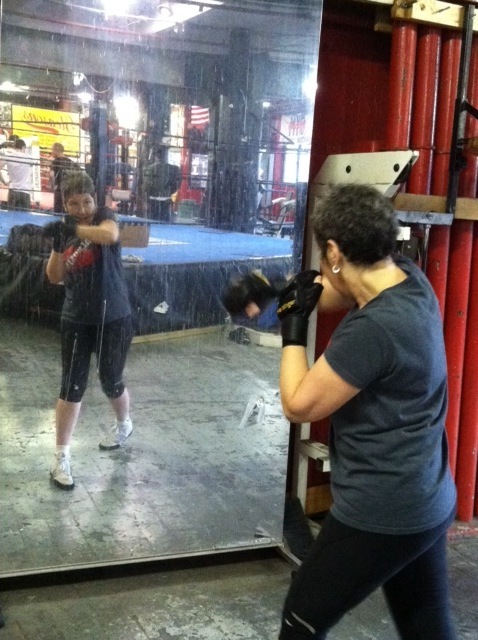 In between her busy schedule, Sonya agreed to do an interview with Girlboxing. 1. You’ve got a fight coming up against Tiffany Woodard on June 14th as Roseland Ballroom in NYC as part of the Broadway Boxing series. Your last time out with Tiffany you won by a split-decision over six rounds. What is your game plan against her this time out? This will be our trilogy. She is a tough opponent not to be taken lightly. We are both coming off a draw and want a win. I plan on working angles and combinations. I will be more active than the last time I fought her. 2. You are 6-0-1 now, that’s quite an achievement. What are you looking to achieve with a win against Woodard? A win! Again, I’m coming off a draw and I need to get that W and get ready for a title fight in the future. 3. What has your training been like for the fight? I know your semester is winding down, but you are still working full-time as a teacher in Harlem. How are you able to make things work? Training has been a little crazy. I fired my trainers and will have Buddy McGirt in my corner. He worked with me about two months ago when he was here training a fighter for a big fight for about a month. Unfortunately, he went back to his home in Florida and I was lost without him. I attempted to work with “Blimp” Delon Parsley and Lennox Blackmore, but neither of them were to aggressive with my training and took it too lightly. I felt I was not being taken seriously enough and needed a change. Work is winding down and the summer is here. I am delighted to greet it. I do my best to balance my career and my hobby. I always put my students first. One Saturday a month I set up a trip for my students to take them out of the city on a hike, or adventure so they can breathe some clean air and work on confidence, self-esteem, and finding themselves. 4. Kaliesha “Wild Wild” West issued a press release with her father and trainer Juan West stating that while women work as hard as men in the fight game, they are not catching any kind of breaks for fight promotions or TV air time. I know that you’ve had a great relationship with Lou DiBella and Broadway Boxing here in New York, but do you feel that Kaliesha has a point? Are things really tough right now for female pro boxers trying to gain the experience, recognition and opportunity that comes with televised fights? Unfortunately, women are not getting what they deserve. I have never been told or heard that my fights are boring or are not worthy of television. I dream of the day that I will fight on ESPN Friday Night Fights, or even Showbox, or HBO Boxing. For now, I am thankful that Lou allows me on his cards and always gives me TV time on SNY and MSG. It’s baby steps for women. Even as an amateur I had to fight against the odds to create a path for the women to get where they are today. I am proud to be part of the movement that opened up women’s boxing at the amateur and professional level. 5. You’ve only fought two fights since last April, one in August one in January–can you tell us what’s been going on in the women’s heavyweight division and why there seem to be so few fights? Boxing is an expensive sport. The promoters want to make money. There is not a lot of money in women’s boxing. With the more wins I get the harder it is to find opponents. There are a lot more heavyweights but not ones that want to fight me. They ask for a lot of money and my promoter can only pay so much. It’s not like Lou is making $100,000 off my fight. I sell tickets to cover my purse and my opponents. I’m waiting for an offer from a woman on her card so I don’t have to worry about tickets and I can be the guest on a show. 6. 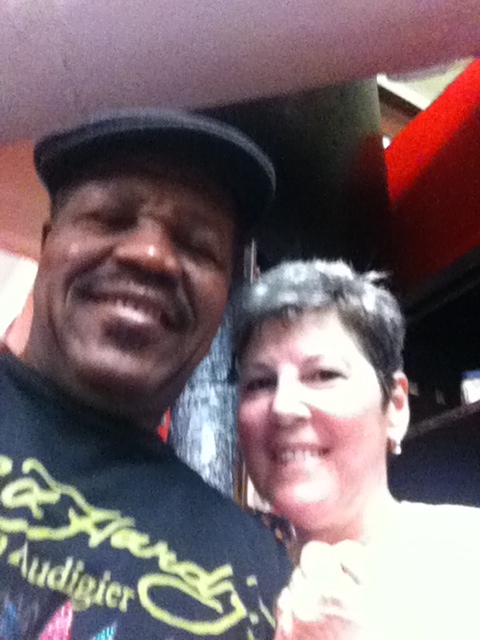 Sonya, you are an inspiration to so many people not only as a boxer, but as a teacher and in your work against bullying. Your personal story is also one of redemption, hope and faith. Tell Girlboxing readers about your work in the community and how it is affecting the lives of young people? Teaching school and guiding children is something I’m good at. I am positive role model for the children academically and personally. I attended colleges and received masters degrees and hold five different New York State Education Certifications in a variety of fields. I’m also an athlete and the students can relate to me. I love all my children and find the good in each of them. I do my best to instill values and morals in them that will lead to towards successful lives. I tell them that if they want to have choices when they are older they need to have an education. Without an education you have no choices to make. You have to take whatever job you can and do your best to survive. As an example, remember that episode on the Cosby’s when Bill gave his son fake money and had him pay bills until he ran out quickly. At that point he wanted more things, but he had no money left. So without an education, your choices will be limited, but with an education you can go anywhere. 7. 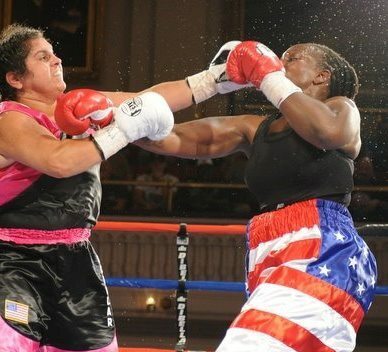 One last question — with the debut of women’s boxing at the 2012 London Olympic Games, what do you feel most proud of? I feel proud to be a part of the movement that accomplished this mission. I attended meetings, competed in the Nationals, signed petitions, advocated for the women and being an amateur boxer allowed me to be part of the debut of women’s boxing. I look forward to the Olympics and hope that it opens the doors for more women in the future of boxing. Check out Sonya’s new sponsor website here! For tickets to Sonya Lamonakis’ Broadway Boxing fight at the Roseland Ballroom in New York City contact Gleason’s Gym: 718-797-2872. Tickets are: $45, $65 and $85. The first bout is at 7:00 PM. Some days are filled with big things and others have the “usual suspects.” The same it seems with working out: peppy for two or three training sessions in a row and then the dogs. We’re talking no energy, no pop and not so much going through the motions as just having no energy to get where you want to go! I had one of those mornings at Gleason’s Gym today. Sure, I did my sweet 16 (four rounds each of shadow boxing, pad work, double-ended bag and speed bag), but did I ever have to work for them. Lennox kept shaking his head saying, “wake up, girl!” And maybe that helped because I did manage to bring it towards the end with two hopped up rounds on the double-ended bag and some serious da-da-da-da / da-da-da-da on the speed bag. In analyzing it later, I realized that part of the problem is I’m still not doing enough during the week to keep the momentum up for a meaningful Saturday session. A clue on how to do that in an otherwise busy life came from my old Peace Corps buddy Mark who had a post on Facebook today proclaiming that he’d hit his goal of 1,000 sit-ups in a week. I thought, “1,000!?! That is a lot!.” Breaking it down to daily increments, however, brought it more in line with what actual humans can achieve! Reading further, Mark wrote about his formula for success: starting at just 130 for the first week until he had brought himself along to 1,000. Given that I struggled through my 100 sit-ups this morning at the gym (having only done 20 all week) — it occurred to me that if I followed Mark’s formula of defining weekly goals, it might get me off my tush and into a regular daily sit-up routine. Not wanting to set the mark too high for myself the first week, I’ve settled on accomplishing 300 between Sunday and Friday. That means 50 a day — meaning about 10 minutes! Seen that way, there is no way I shouldn’t be able to achieve it. 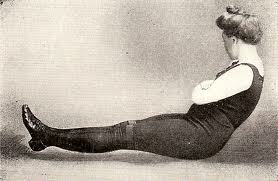 The same thing for push-ups — or my version of them which means on my knees or against a bar at this point. Sure, I did 20 today at the gym (in two sets of 10 each), but it was hard and strained my shoulder. So there again, I’ve decided on setting a goal between Sunday and Friday. I’m staring off with 60, that means 10 a day — or another 5 minutes a day at most! Summed together, if I give myself a mere 15 minutes a days, I can meet my weekly goal and have sacrificed nothing. No excuses here! Kudos to Mark for a great idea!